The Pro+ will allow you to upgrade to a two piece rotor (a popular upgrade due to cosmetics and weight savings). This is the first system they offer that will allow you to have the exact same looking brake front and rear! 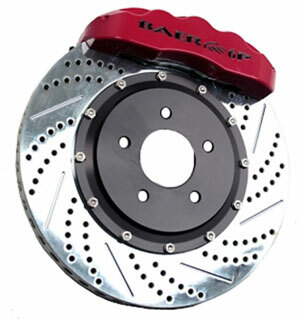 This kit is a 14" two piece rotor and utilizes brake pads from the 1997-2012 C5 & C6 Corvette. Calipers available in black (B), red (R), or silver (S). Note: Must use CPP Modular spindles.